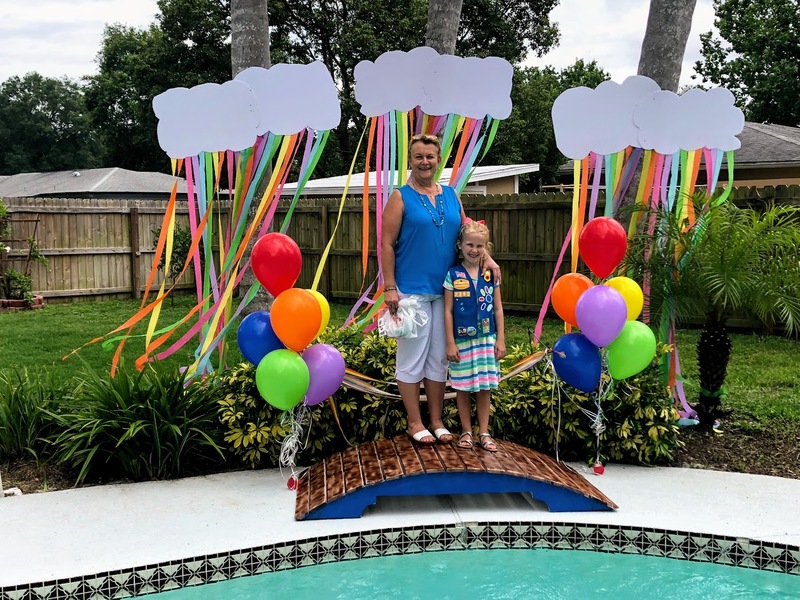 This past Saturday, my mom and I hosted Gracie’s Daisy troop bridging ceremony at my house. Our Girl Scout troop was bridging from Daisies to Brownies, which happens at the end of 1st grade. It has been such fun leading a troop with my mom these past two years. I can’t believe we have finished Daisies already! I was so proud of Gracie for all her hard work. And it has been especially fun to see Gracie and my mom get to do something fun together. Those two are so close anyway, but this was special because it’s something that is just for the two of them. Gracie thinks it is the best to have Nana as her troop leader. I was a little worried about the weather on the morning of our ceremony. 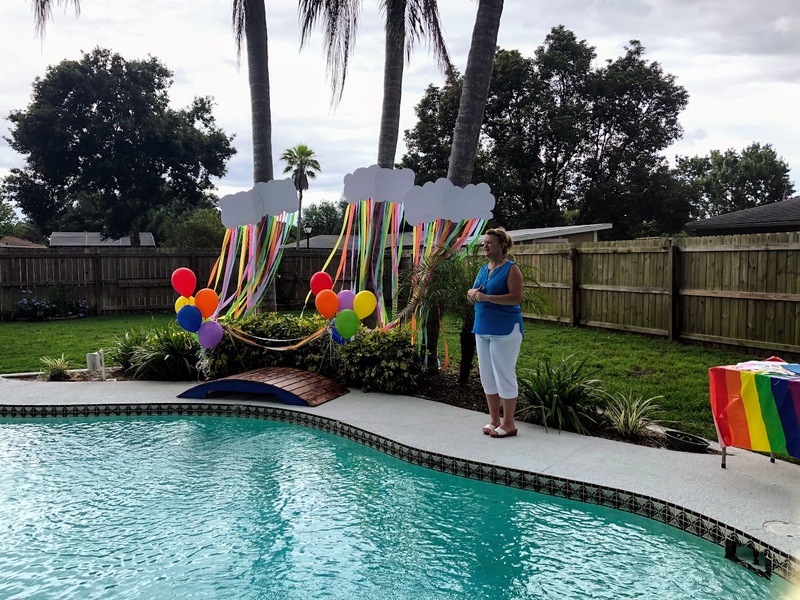 It has been raining for weeks here in Orlando and our plans of having a backyard ceremony were starting to get a little mushy looking. Thankfully, the weather held out until we finished! We chose to have the ceremony outside because it gave us a little more room to set up our bridge and staging area. 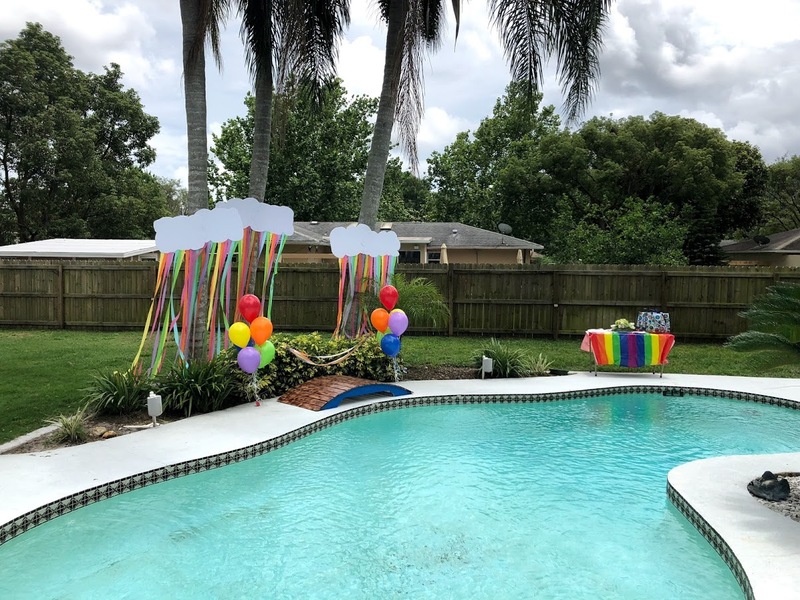 The balloons are from Publix and I used rainbow streamers that were leftover from another party we had. 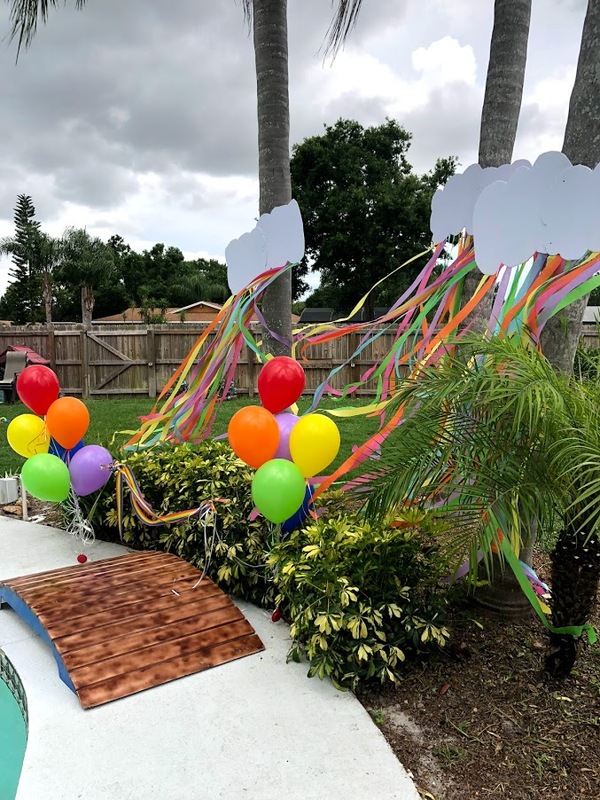 I used two small yard flag stands that I had in my garage to hold our streamers and balloons next to the bridge. 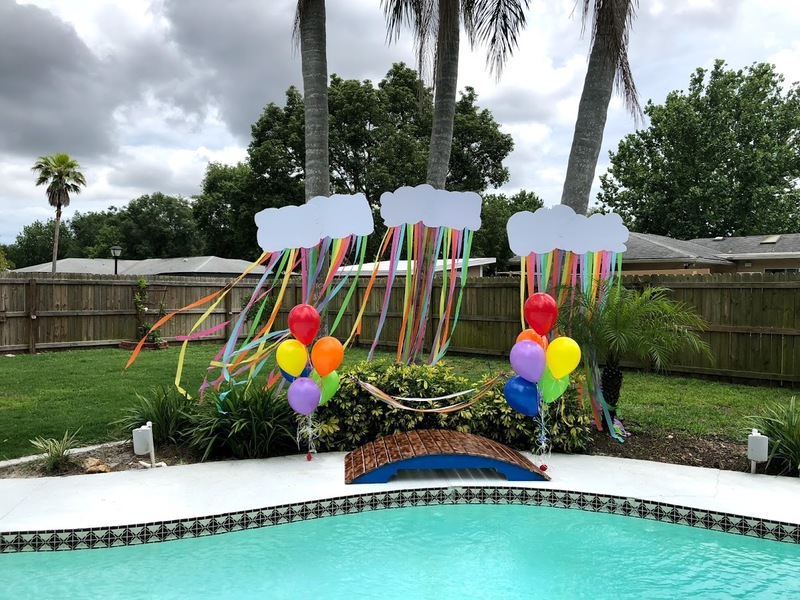 I had to come up with this after I originally used the little balloon anchors that come with the balloons but they weren’t strong enough and I looked outside and found all my balloons in our pool! So, tip #1: definitely use some kind of anchor! We borrowed the bridge from Bean’s old Cub Scout den. They use it for their crossover ceremony every year. I would definitely suggest asking around your area scouting groups (both Girl Scouts, Cub Scouts, and Boy Scouts) to see if they have a bridge you can borrow. If you can’t find a bridge, I found some really cute bridge ideas on Pinterest, too. This one was my favorite and would have been what we used if we didn’t have the Cub Scout bridge. My mom made these super cute clouds for us to use as decoration. She bought foam core from Michaels in the poster board section. She drew out big puffy clouds and cut them out (we used scissors, but it was a little cumbersome; I’d use an box cutter next time). Then, she taped really long streams to the back of each cloud. When we hung them, we put two of her clouds together on each tree to make them seem even bigger. 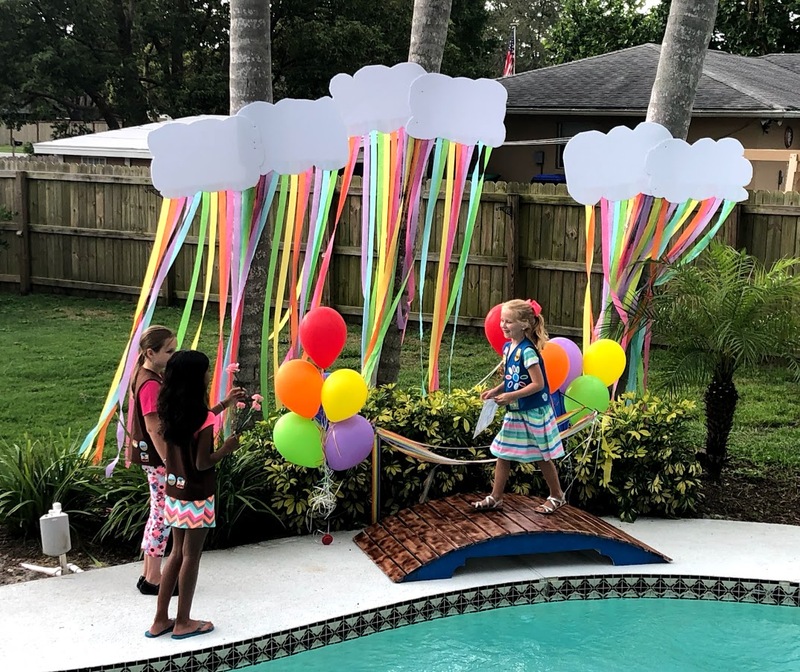 When the weather looked like it might not cooperate, we made a back up plan of moving the bridge ceremony inside to my living room. If we had done this, we were going to hang a piece of fishing line on my wall with two tacks and then hang the clouds from this sting at varying lengths. I think that would have worked fine, but it came out so much cuter outside. Except when the wind blew it was kind of… messy. Mom also ordered our cake from Publix, too. We expected about 30 people to attend, so we ordered a half sheet cake. Mom found this picture of a bridging ceremony cake on Pinterest and took it with her to Publix. They were able to recreate it for us and it came out perfectly! We provided the cake, lemonade, and utensils and asked each family to bring a snack to share. We ended up with fruit platters, meat and cheese trays, chunked up watermelon, and brownies. It was a really nice turn out. We set the food spread up on my dining room table and after the outside ceremony, we came inside to enjoy food, company, and the air conditioning! Orlando is hot! It was a really simple, easy ceremony to put together and everyone had such a nice time. 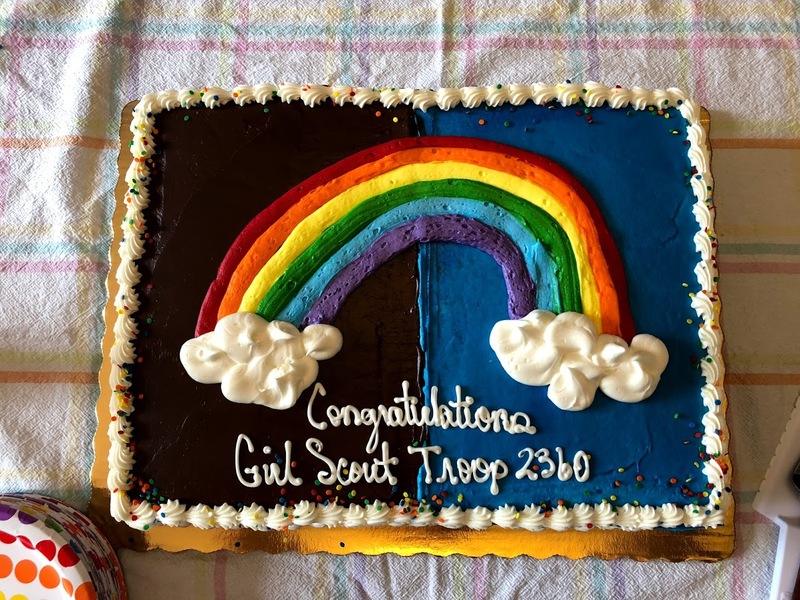 It was the perfect ending to another really fun year of Girl Scouts! 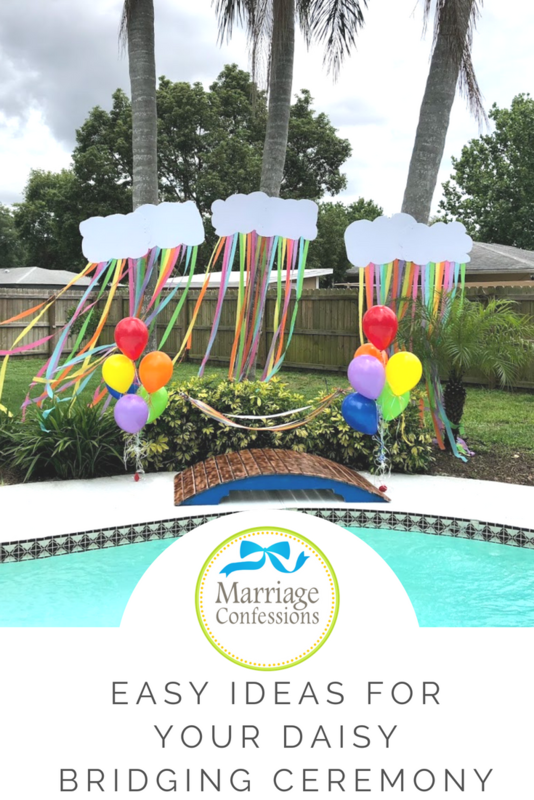 The post Ideas for a Girl Scout Bridging Ceremony appeared first on Marriage Confessions.